Today I got to check out the Groovy White Nimbus Striped CRB in store along with the Pizzaz Energy Bra and the Contempo Jacket in Cool Breeze/Power Purple. I instantly fell madly in love with the Groovy Striped Cool Racerback when I realized it was soft and not 97% polyester like all past printed Cool Racerbacks have been. This one does have a bit of polyester in it (52% Poly, 40%Nylon, 8% Lycra) but that is a noticeable difference to me from what the printed-patterned poly CRB’s have felt like in the past. 80-99% polyester feels like plastic to me and are quite sheer, while 47% makes it almost not noticeable. This is the first one I’ve seen thats been 52% and it’s pretty soft, if you have the Power Purple/Aquamarine one this one feels the same. Although, my preferred CRB’s are the solid ones with zero polyester, I will use the heck out of this one. I went with my TTS 8 and it doesn’t feel snug like the Power Purple/Aquamarine one did. Another big bonus is that this is another ‘designed in Vancouver, Made in Canada’ CRB. I’m loving how many of the new items that are coming out are made in Canada. So far, the Power Purple and Power Purple/Aquamarine CRBs and the Charcoal Wunder Unders are all made in Canada and last year there were a few CRB’s as well (Pop Orange, Pow Pink). I can’t tell you how happy it makes me that Lululemon is now making items in Canada again, and I am very happy to be voting with my wallet on those items. The print itself is amazing. They all varied in stripe placement but none of them where glaringly weird or ugly or crooked. I found them all pretty balanced actually. 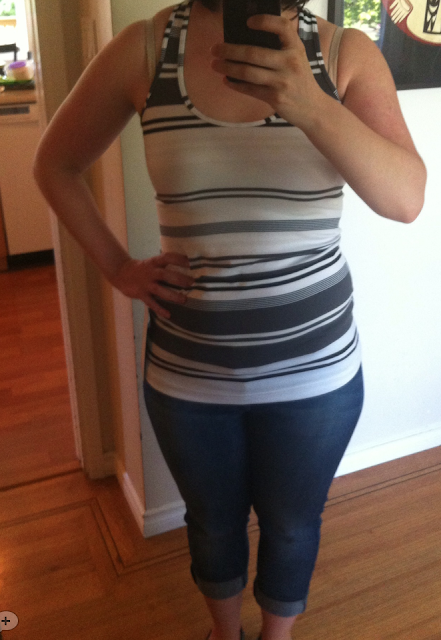 I went with this one because I liked how much Soot Light there was, and I liked the darker stripes over my mid section. Not much science to how I chose this one but it looked good to my eye. I have another one coming to me tomorrow from the upload so I will decide then which one looks the most flattering, and has a lot of soot light in it. The Contempo Jacket in Cool Breeze/Power Purple I didn’t actually try on but I did check it out and the Cool Breeze has a stripe pattern in it. Almost like Tonka Stripe from last year but at a diagonal and it’s slightly textured like denim. Sadly, Pizazz Energy Bra was already sold out in my size even though they got them in yesterday. I liked the color (mostly to pair with other colors) but I wasn’t in love with the color itself on me so I didn’t feel the need to race out to another store for one. If it uploads on Monday, I may like to get one, but I can live without it. It’s a really nice vibrant mandarin orange which makes a great pop of color with Navy’s and greys or purples and pinks.